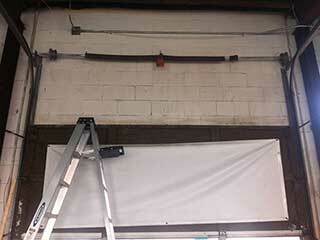 Without its springs, your garage door wouldn't be able to open. Regardless of whether it's manual or automatic, these components are intimately involved in the process of opening and closing the door. Because they are under a lot of tension, they can be very dangerous to handle. That's why you need to leave any spring replacement or adjustment task to our professional technicians. Torsion springs are the ones that are often preferred, due to their higher durability and flexibility. These units are installed horizontally, just above the door, and they work by twisting and rotating cable drums that in turn wind cables that pull the panels up. Extension springs work differently. They stretch and contract rather than twist and unwind, and are less durable and tend to last for a shorter time, which makes sense considering they are the older of the two types. Torsion springs need to be lubricated regularly in order to keep their condition optimal. Doing this can actually extend their longevity and ensure their smooth and silent performance. If their tension grows loose, the door may get unbalanced and uneven, and tension adjustment will be required to correct this. Replacing these components can be incredibly dangerous, due to the fact that this type of task involves releasing and reloading high amounts of tension. If it is performed by amateur DIY "experts" the risks of a serious injury can be great. A broken spring will make your door inoperable, as it will no longer be able to produce the tension necessary to lift it. However, it is still extremely dangerous to try and replace it by yourself, which is why you need to reach out to our team in such an event. No matter what type of springs you have, or what type of related task you need doing, you can count on our experts at Garage Door Repair Kaysville to take care of it for you safely and quickly. Give us a call today.